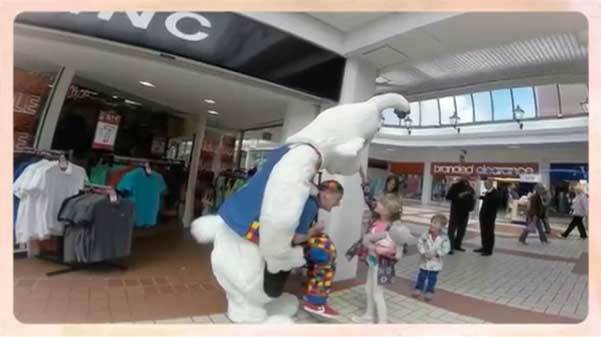 Dozy Dave joins Harvey the giant magic rabbit BRAND NEW Strolling Rabbit Illusion! Harvey is a giant magic rabbit, who is 9ft tall and walks throughout your event, festival or party holding a huge magician's top hat with Dozy Dave inside it! From within the hat Dozy Dave performs “On-the-Spot Entertainment” presenting interactive magic and balloon sculpturing. This style of interaction is a highly effective way to create unique non-stop entertainment all day long and maintain a consistent upbeat atmosphere. 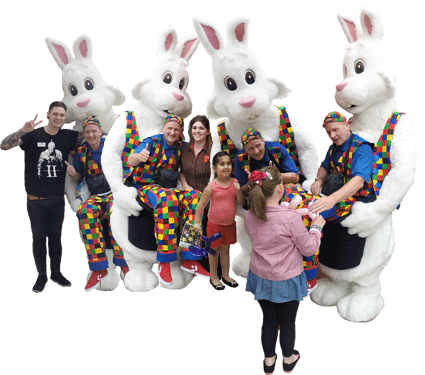 Dozy Dave & Harvey the giant magic rabbit can interact with customers and audiences like no other type of promotional character. People love to have their photographs taken with this amazing character and Dozy Dave can tell them all about products, services, or just provide entertainment. He can even hand out leaflets, or bring them along to your stand, or booth! The back of Harvey's jacket is velcro receptive to allow your company name or logo to be placed on his back. Should you wish we can change the clothing to match your companies uniform of branding, which will further enhance the marketing effectiveness of this already unique item. For further details, or to book Harvey the Giant Magic Rabbit please either call us on 07831280099 or click HERE. Available within the UK and worldwide.